The center left is in trouble. Looking at recent political events and their discussion among pundits, journalists, and academics, that much seems clear. The recent electoral struggles of social democratic parties have been linked to their economic as well as cultural positioning. The economic story in a nutshell goes something like this: As a result of their neo-liberal and third-way economic policies social democratic and other mainstream left parties have alienated their working class supporters, who in turn have found a new home with right-wing populists such as Donald Trump or Marine Le Pen. There has been much debate about this question and despite most empirical evidence speaking against this narrative, it is still one of the dominant explanations for the electoral demise of social democratic parties. In this contribution I want to focus on a second narrative which stresses the role of the cultural dimension for the electoral losses of mainstream left parties. Cosmopolitan elites within these parties, so the story goes, detached from the needs and demands of their core supporters, have so strongly pushed for progressive change in fields such as women’s rights, European integration or multicultural issues that they have created a window of opportunity for the anti-elite and anti-immigrant appeals of radical right parties. In combination with their changing economic positions, this has resulted in an electoral erosion of working class support for mainstream left parties and finally culminated in the populist triumphs of Brexit and Trump. The near death experiences of the PvdA in the Dutch parliamentary and the PS in the French presidential election (both received less than 7% of the vote) constitute the logical continuation of these developments. As I will argue in this contribution, this narrative fundamentally misrepresents the electoral dynamics of mainstream left support in post-industrial societies. It overemphasizes the degree to which working class voters have abandoned them for other parties, as well as the role that this group plays for the electoral success of the mainstream left. On the contrary, I will argue that in the aftermath of Brexit and Trump, parties of the mainstream left necessarily need to present a pro-European and more universal/cosmopolitan position in order to appeal to educated middle class voters that are crucial for their success. I will illustrate this argument with three cases: the Dutch parliamentary election, the French presidential election and the large polling increase of the German SPD following the nomination of Martin Schulz. A recent study by Jane Gingrich and Silja Häusermann (2015) demonstrates two things about the composition of the social democratic electorate in post-industrial societies that are crucial to understanding the dynamics of their electoral (mis-)fortunes. First, in contrast to much public belief, working class support for social democratic parties has been relatively stable since the 1980s. While one can see some decline in support especially in Northern European countries, the empirical evidence certainly does not warrant the narrative of social democratic parties having lost all their former working class supporters. Second, middle class support has become increasingly important for the electoral fortunes of social democratic parties. The reason for this lies in the numerical decline of the working class as a share of the overall electorate. Hence, constant or slightly declining working class support necessarily leads to a much larger share of educated middle class supporters among the social democratic electorate. This fact is crucial to understanding the fate of social democratic parties in recent elections and stands in contrast to a public narrative that largely focusses on how social democratic parties have lost their working class voters to for example the populist radical right. It also constitutes a central element for understanding the potential effect of issues such as European integration or immigration on the electoral prospects of parties of the mainstream left. Until very recently, issues such as immigration or cosmopolitanism more generally were politicized asymmetrically. Parties that positioned themselves more strongly against for example immigration also tended to emphasize these issues much more as these issues were largely used to appeal to the losers of globalization (Kriesi et al. 2008). Mainstream parties on the other hand that had generally more positive positions on immigration were likely to try to avoid these issues and keep them out of public attention. Looking at data form the Chapel Hill expert survey demonstrates this phenomenon. Own calculations. Data from Chapel Hill Expert Survey 1999-2014 cumulative file (http://chesdata.eu/). Black dots mark party positions and their issue salience on immigration. The blue line represents a linear fit between these variables. The figure shows parties’ position on immigration issues as well as their emphasis on these issues for Western European democracies in the period from 2006-2014. 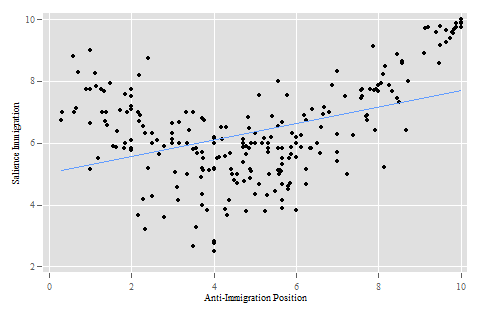 We can see a quite pronounced correlation between anti-immigrant positions and salience of immigration issues for these parties. While there is a small share of parties (mostly green and left libertarian) which emphasize immigration issues while having a pro-immigration stance (upper left corner) for the large share of parties we can see how the salience of immigration issues increases with anti-immigrant position. One major reason for this asymmetric politicization lies in center left parties believing that there was not much to win with emphasizing these issues. Immigration, globalization or European integration were vote defining issues for those that were against. While educated middle class voters generally had more positive attitudes on these issues, only a small share of them (largely belonging to the group of socio-cultural professionals) based their vote choice on these issues. There is, however, strong evidence that this has changed in the aftermath of Brexit and the Trump election. Pro-EU social movements are holding regular events with high turnout rates, support for European integration has increased in many countries, newspapers are full with lead op-eds calling for a defense of the European project. For social democratic parties who are increasingly reliant on middle class support, this politicization should have fundamental electoral consequences. We should thus expect to see that social democratic parties will fail to succeed if they do not credibly provide an open, cosmopolitan and pro-EU appeal to the educated middle class. While we still lack the data to put this hypothesis to a definitive test, three recent political events clearly provide support for this idea: The Dutch parliamentary election, the French presidential election and the large increase in support for the German SPD after the nomination of Martin Schulz. The results of the Dutch parliamentary election on 15 March 2017 showed three main developments. First, prime minister Mark Rutte and his VVD came out clearly as the strongest party despite losing 8 seats. Second, the populist radical right PVV of Geert Wilders underperformed the expectations but still ended up as the seconded strongest party in the Dutch parliament. Third, the social democratic PvdA was decimated to less than 6 percent of the vote and lost 29 seats in parliament. In order to understand the electoral losses of the PvdA a couple of points seem noteworthy. First, the result cannot be interpreted as a simple linear decline in support of the PvdA. With 24.8 percent of the vote in the highly fragmentized Dutch party system, they had a comparatively strong result in 2012, outperforming their election results of 2010, 2006, 2002 and 1994. Hence, the crucial question is: how did the PvdA end up with such a devastating result despite its strong showing in the 2012 election? While there is certainly not one single explanation for this change, it is helpful to see which parties the PvdA actually lost seats to. The public narrative leading up to the election strongly focused on the PvdA losing working class voters frustrated with their economic and social policies to the far right PVV and far left SP. However, based on estimations by the polling firm IPSOS out of the 29 seats that the PvdA lost in this election only 2 went to the PVV and 4 to the SP. In contrast, the PvdA lost a total of 13 seats to parties that strongly campaigned on an open, pro-immigration and pro-EU platform (8 to Groen-Links and 5 to D66). Hence, the PvdA, whose campaign could best be described as “muddling through” on these issues, lost its largest share of voters to exactly the parties that provided a strong pro openness platform. Looking at the regional distributions of vote shifts, it is very likely that within an environment in which issues such as immigration and European integration were highly politicized, the PvdA lost its educated middle class to parties that offered a clear positive position on these issues. The first round of the French presidential election that took place on 21 April 2017 provides a very similar picture. While Marine Le Pen made it to the second round of the presidential election, she – in a context that should have largely favored her – barely managed to improve on her 2012 result. With Emmanuel Macron a 39-year old centrist won the first round. The Parti Socialiste only gained 6.4 percent of the vote and for the first time in the Fifth Republic no candidate of the two major parties made it to the second round. Figure from Mathieu Gallard. Data from Ipsos: (http://www.ipsos.fr/sites/default/files/doc_associe/rapport_vague13.pdf). This Figure created by Mathieu Gallard using polling data from IPSOS shows estimates on voter transitions between the 2012 and the 2017 presidential election and can thus help us understand to which parties the PS lost most of its voters. First of all, we can see that only a small share of 2012 PS voters decided to vote for the Front National in 2017. Second, it is striking that Emmanuel Macron received more votes from former PS voters than Benoit Hamon (the PS candidate in 2017) and Jean-Luc Melenchon (the far left candidate) combined. Similar to the Dutch case, we can see that the candidate that most strongly ran on a pro-EU and openness platform managed to win the largest share of former social democratic voters. Again, much speaks for the fact that in an environment where immigration and European integration were highly politicized, this message was necessary in order to gain votes from educated middle class voters. As a final case I want to discuss the polling surge of the German SPD after the nomination of Martin Schulz as their candidate in January 2017. While this event of course provides us with less solid evidence than an election outcome, it demonstrates the potential electoral appeal of a decidedly pro-EU profile. When in January the SPD surprisingly decided to make Martin Schulz, the former President of the European Parliament, their chancellor candidate for the German general election in September, this led to a surge of support for the SPD in the polls. The bi-weekly Politbarometer poll saw an increase in vote intention for the SPD of 8 points, the highest change ever recorded by this institute. So what had happened? Based on research on electoral behavior in Germany and elsewhere, it is unlikely that a shift of that magnitude can be explained solely by valence factors such as positive leadership evaluations or competence. Crucially and in addition to a generally positive evaluation of the candidate, with the nomination of the former president of the European Parliament, the SPD has seemingly become the political vessel for a pro-EU and anti-rightwing-populism sentiment in Germany. Interestingly, the increase in vote intention for the SPD after the nomination of Martin Schulz coincides with a decrease in people wanting to vote for the Green party, the party that has traditionally been most associated with progressive positions on issues such as immigration and as representing the interests of an educated urban middle class. 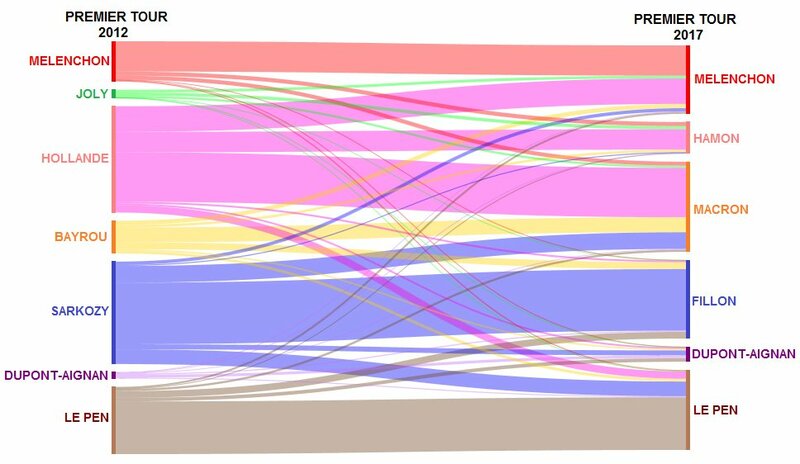 And a first look at the campaign panel of the German Longitudinal Election Study indeed indicates that a large share of newly gained SPD supporters supported the Greens not too long ago. Hence, the nomination of a clearly pro-EU candidate and increased emphasis on the importance of European integration (as could be seen at the last Parteitag) seem to play a crucial role for the recent polling increase of the German social democrats. This increase stands in stark contrast to a large share of mainstream left parties in Western Europe that are witnessing historically bad results in elections and polls. In sum, these three recent developments indicate how important it has become for parties of the mainstream left to provide a pro-EU and pro-openness position in order to appeal to an educated middle class that now constitutes the core of their electorate in most Western European countries. In contrast to recent public contributions that suggest that these parties have become too cosmopolitan to be electorally successful, I have outlined here how post-Trump and post-Brexit the opposite seems to be the case. Beramendi, Pablo, Silja Häusermann, Herbert Kitschelt, and Hans-Peter Kriesi, eds. 2015. The politics of advanced capitalism. New York: Cambridge University Press. Gingrich, Jane, and Silja Häusermann. 2015. “The decline of the working-class vote, the reconfiguration of the welfare support coalition and consequences for the welfare state.” Journal of European Social Policy 25 (1): 50–75. Kitschelt, Herbert. 1994. The transformation of European social democracy. Cambridge studies in comparative politics. Cambridge, New York: Cambridge University Press. Kriesi, Hans-Peter, Edgar Grande, Romain Lachat, Martin Dolezal, Simon Bornschier, and Timotheos Frey. 2008. West European politics in the age of globalization. Cambridge, UK, New York: Cambridge University Press. Rueda, David. 2007. Social Democracy Inside Out: Partisanship and Labor Market Policy in Advanced Industrialized Democracies. Oxford Scholarship Online. Oxford: Oxford Univ. Press. Important academic publications on the struggles of social democratic parties in post-industrial societies include: Kitschelt, Herbert. 1994. The transformation of European social democracy. Cambridge studies in comparative politics. Cambridge, New York: Cambridge University Press; Rueda, David. 2007. Social Democracy Inside Out: Partisanship and Labor Market Policy in Advanced Industrialized Democracies. Oxford Scholarship Online. Oxford: Oxford Univ. Press; Beramendi, Pablo, Silja Häusermann, Herbert Kitschelt, and Hans-Peter Kriesi, eds. 2015. The politics of advanced capitalism. New York: Cambridge University Press. Dieser Eintrag wurde veröffentlicht in Allgemein, English posts und verschlagwortet elections, Populism, social democrats, Sozialdemokratie von Tarik Abou-Chadi. Permanenter Link des Eintrags.